Deacon Martin Garcia participated in a breakout session April 14 at the Region X encuentro in San Antonio. The regional encuentros taking place across the country are preparation for the national encuentro in September in Grapevine, Texas. SAN ANTONIO — Answer the call to missionary discipleship by addressing the needs of your Church. Meet young people where they are and just listen. Improve catechetical resources and prepare future leaders. These were some of the strategies discussed by more than 800 delegates representing 18 Catholic dioceses in Texas, Oklahoma and Arkansas, as they participated in a bilingual three-day Region X encuentro in San Antonio April 13-15. Regional meetings are the latest phase of preparations for the U.S. Catholic Church’s Fifth National Encuentro, or “V Encuentro,” to be held Sept. 20-23 in Grapevine, Texas. Previous national encuentros were held in 1972, 1977, 1985 and 2000. Encuentro is a multiyear process to discern the needs, aspirations, and faith practices of the 29.7 million Hispanic and Latino Catholics in the United States. First came parish-level encuentros, then the diocesan gatherings and now the regional encuentros are taking place. The process for the upcoming national encuentro — inspired by Pope Francis’ 2013 apostolic exhortation, “Evangelii Gaudium” (“The Joy of the Gospel”) — began in 2014. “What is the Holy Spirit calling us to at this moment as a region?” asked Ken Johnson-Mondragon, the Fifth National Encuentro’s research coordinator, as he presented to delegates in San Antonio a regional working document based on diocesan findings. He added that the conversations among participants while using the document as a discernment tool were most important. 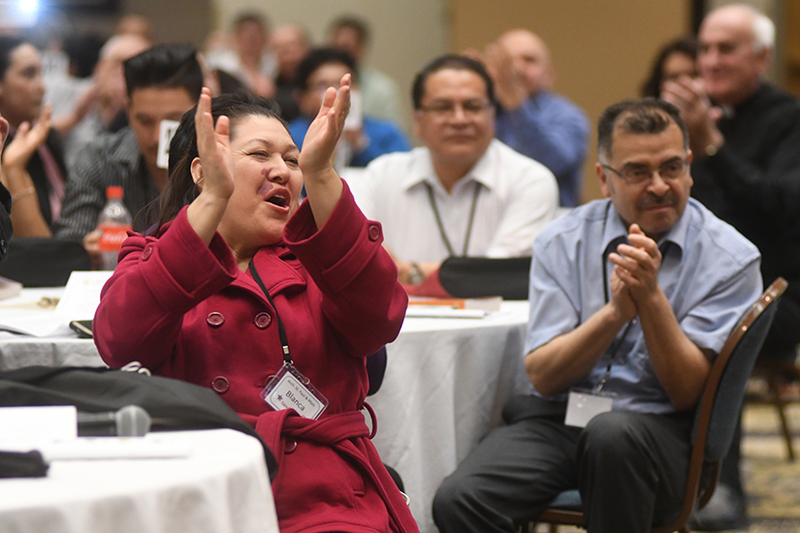 Participants in the Region VIII encuentro clapped at an evening talent show April 13 at Arrowwood Resort and Conference Center in Alexandria, Minn. The regional encuentros are part of a multiyear process to discern the needs, aspirations, and faith practices of Hispanic and Latino Catholics in the United States. The delegates worked in about 80 small groups to talk about challenges, opportunities and successful practices in areas like evangelization and mission, faith formation and catechesis, youth, family ministry, immigration and theology. Their recommendations will be presented before the national encuentro in Grapevine. According to the working document, Hispanic Catholics make up 6 million of the estimated 8.4 million Catholics living in the U.S. Church’s episcopal Region X. Some dioceses in the region, like Beaumont and Fort Worth, Texas, Oklahoma City and Tulsa, Okla., and Little Rock, Ark., have seen their Hispanic population increase more than 100 percent between 2006 and 2016. The encuentro weekend was full of honest and fruitful dialogue in both Spanish and English, bilingual presentations, and time for prayer and song. Over 20 bishops from the region accompanied the delegates throughout the weekend, with many choosing to participate in the small working groups’ conversations. During the discussions, delegates representing different ministries and cultures, shared some of the early fruits of “V Encuentro,” which included increased participation, more resources for Hispanic ministry and a renewed openness to encountering Jesus in those most vulnerable. “Parishioners are going beyond their comfort zones and take time to hear those in need,” said Lily Morales, Hispanic ministry coordinator for the Dioceses of Austin, Texas. She described how touched people have been by the process of going out and encountering people in the peripheries during their parishes’ encuentros. Listening and sharing experiences during the Region X encuentro gave delegates ideas on how to get more involved and serve their community. Organizers explained that the multiyear “V Encuentro” process seeks to activate at least 20,000 new Hispanic Catholic leaders nationwide. Jackie Flores, a youth minister at St. Thomas More in Tulsa, said that the “V Encuentro” process encouraged her to evangelize in her community and family. “The ‘V Encuentro’ helped us to see that we don’t only need to help ourselves but we need to help others,” she said. Another priority of “V Encuentro” is to reach out to U.S.-born Latinos, said Julio Beltran, coordinator for the Pastoral Juvenil (Hispanic Youth and Youth Ministry) in the Diocese of Beaumont and chair of the Region 10 Team. There is not “one way” to reach out to the second- or third-generation Hispanic Catholics, Beltran said, but we can empower them from their reality. “We cannot have a culture of ‘English only,’ ‘Spanish-only’ or ‘We have always done it this way,’” he added. Parishes and dioceses must try to provide a sense of community along with catechetical and leadership formation for both first and second generation Hispanic Catholics. Beltran echoed the comments of youth ministers at the regional in San Antonio by saying that young people yearn for authentic concern for their well-being and their future and someone willing to accept them as they are and accompany them in their journey.